The real value of India's forests is too enormous to calculate, but there are estimates. 55 million people, about half the country's population, depend on forests for fuelwood, fodder, medicinal plants and other forest produce. Forests provide essential services like water, clean air, and soil conservation, which cannot be manufactured. And they do not send anybody a bill for these. Just in the state of Himachal Pradesh, these services were valued at Rs 10,66,64 crore per year. In Madhya Pradesh, it was Rs 22,54,59 crore each year. In 2005, based on rates set by the Supreme Court of India, the net value of India's forests was estimated at Rs 5,92,01,90 crore; India's gdp at constant prices is Rs 78,23,57 crore. All this natural wealth is managed by the Indian Forest Service (ifs) that has long argued it is underpaid and undervalued; its salary scales have been below those of the other all-India services like the administrative, police and foreign services. In August 2008, the service--India's largest landowner--got a major pay hike. Now, most senior forest officers would get paid at par with chief secretaries of the administrative service (ias). The parity is limited, though. While ias officers get regular promotions, forest officers take 18-25 years for two promotions. Most ifs officers retire before reaching the top post of principal chief conservator of forests. They rarely get important administrative posts like secretary or chief secretary. "It is up to the Union ministry of forests and environment and the department of personnel and training to remove this disparity. The ministry controls the forest service cadre and the department makes the rules for all three services," said A N Prasad, president of the ifs association and head of Project Elephant. This, forest officers know, is not likely to happen. "This tussle between the services is old," said A K Mukherjee, retired forest officer of Himachal cadre. "Even before 1947, the civil service [ias's precursor] baulked at the creation of a forest service. They felt they could handle forestry, too." The tension, he said, was over control, ias would not want to give away power. Then there are officers who think little of this comparison. "ifs has been reduced to a competition with ias. Pay parity is needed but this is not the sum total of the service," said S Shyam Sunder, who joined ifs in 1953. P K Sen, who was in the first batch after the service was reconstituted in 1967, agreed "This comparison damages the functioning of the service." ifs sorely lacks direction and focus, feel several retired foresters. They fear the service is letting decision-making slip out of its hand, concerning itself only with issues of pay and timely promotions. They are referring to the Supreme Court, which has become a big influence. Under an omnibus forest case that began in 1996, it has passed several orders that take over the functioning of the ifs. For example, the environment and forest ministry is supposed to grant permits for use of forestland for mining; now this has to be approved by the court's Central Empowered Committee. "Foresters in India became defensive consequent to the apex court taking a proactive role and criticizing, across the board, the foresters' action in managing this natural resource," said J C Kala, who in 2006 retired as director general of forests. The service cannot be discussed today without understanding the forest case in the Supreme Court. When it began in 1996, India was rapidly losing its forests. The court intervened in several ways stopped mining in protected areas, shut down unlicensed saw mills, and brought in a large amount of land under Centre's control by expanding the definition of forests. The impact on the service is seen variously. "The court's involvement has not curbed the forest department's powers much. In fact, it has extended its powers," said Shankar Gopalakrishnan of the Campaign for Survival and Dignity, which defends forest dwelling people whose land rights have not been settled. "Earlier the department would invoke the spectre of conservation to evict people, now it is the court's orders." From this perspective, the judiciary and the executive have only strengthened each other. Conservationists see it differently. "The court is stepping in because the service failed to do its job. [The court is] curbing some excesses being committed in the name of development, often with the connivance of a pliant forestry sector," said K Ullas Karanth, scientist with Wildlife Conservation Society in Bangalore. "Originally, the forest service had a mandate to protect forests against inroads of development". He said the court was forced to step in because the service drifted off this mission over the last one decade. Forest officials want more autonomy. "The Supreme Court is the highest judicial authority. It should decide on legal aspects, not come down to prescribing management issues," said Shyam Sunder. The court orders have centralized forestry. "Earlier, the states used to decide what needed to be done based on their local knowledge; now they just look to the Centre," said Prasad. Now, the states merely implement the Centre's policy--and, increasingly, the court's orders. This has brought about the fourth fundamental change in the attitude of the service in its 140 years. ifs started as an imperial British setup in 1867 to manage forests for timber. A German forester, Dietrich Brandeis, became the first inspector general of forests. ifs officers view him as the noble ancestor, who married the needs of timber with conservation. V K Bahuguna, former inspecter general of forest and now on deputation to the agriculture ministry, said the forest and wildlife remaining in India is the legacy of foresters like Brandeis, who walked the length and breadth of India's forest. "Indian forestry developed on foot, developed by Brandeis and people like him," he said. The first major change happened in 1914 when the British navy's demand for timber during the world war led to clear felling of large forests, Bahuguna said. This ushered an era of timber-centric forestry. In 1935, forestry was handed over to the provinces and the imperial forest service was discontinued. Each province--each state after the country's independence in 1947--maintained its own forest service. This changed in 1967; one hundred years after the the imperial service, the Indian Forest Service was reconstituted. Forestry, though, remained a state subject. Foresters were responsible for policing forests and regulating felling and quarrying, as also controlling people's access to forest. Conservation was not their responsibility. This reflected in training. Karanth said foresters were oriented to turn over revenue to the government, not towards ecological protection, particularly after the 1967 centralization. The states created forest development corporations for harvest and sale of timber and plantation of commercially valuable species like teak and conifers. The demand for a million railway sleepers each year drove the timber extraction. The next change came in the 1970s, when the focus shifted to conservation. The Wildlife Protection Act of 1972 started a process that culminated in the 1980 Forest Conservation Act. ifs was confronted with conservation, for which it had little training. Five years later, a ministry of environment and forests was created, further centralizing forestry. The National Forest Policy 1988 identified viewing forests as revenue earning resources as one reason for forest depletion. Logging operations started declining, and when the court took on the forest case in 1996, things changed drastically. The impact on forest development corporations was sharp, said M K Sharma, former director general of forests. "Their purpose was to bring in revenue for the department. Now that timber is no longer an option, there has been no investment in the corporations," he said, adding that they need funds to develop non-timber forest produce like medicinal plants to bring in revenue. A service built on policing has to handle programmes like Joint Forest Management, which go against all that it was taught till recently. The service is ill-equipped to face challenges of the times. From managing timber to managing conservation and participatory forest management to the implementer of Supreme Court orders, ifs's role has gone through a sea change over the past three decades. There is confusion and lack of focus in the service. In 2003, the Centre constituted the National Forest Commission. Headed by retired chief justice of India, B N Kirpal, it reviewed the working of the forest and wildlife sector and made a string of recommendations. Among them was identifying, on priority, a well-defined vision and goal for the forest service. The government has created several divisions in state forest departments; apart from territorial units, there are divisions for subjects like social forestry and afforestation. It was to make the system efficient by reducing workload, but has backfired.The commission noted it had led to overlapping jurisdictions. Uncoordinated units are actually more inefficient. Several protected areas lacked working plans. Park managers, lacking knowledge and commitment, were developing the protected areas by making roads and watchtowers when these were uncalled for, or even detrimental to conservation, the commission said. In fact, the working plans are a farce on conservation. Created every 10 years for each division, they lay down the division's targets, ways to achieve them, and budgetary allocation. The plans are based on the working plan code of the service, which draws from the Centre's forestry policies. "The plan puts down how much timber will be extracted, what will be planted, and when it will be harvested," said Mukherjee. After a Supreme Court order to check the plan deviating from the code, the state has to send the plan to the Centre. The code is now being revised, Mukherjee added. The creation of divisions requires some officers be stationed in district headquarters, in towns. 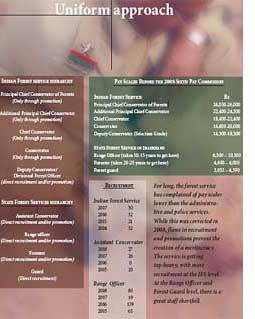 These postings are preferred by all officers. "On paper posting is in rotation, but in reality it doesn't occur," said Rajneesh Kumar Singh, in charge of the Mukhi range in Kanha National Park of Madhya Pradesh. "People in territorial posts avoid field posts because of the hard life there. No schools, no hospitals, no electricity. Wildlife or field posts are considered punishment postings." This has an impact on forestry skills and competence. "Foresters today are going soft, they want to live in cities and travel only by car. You can't do that. You can't say that you won't walk in the forests or interact with villagers. A forester must be in the forest," said Pankaj Khullar, principal chief conservator of forests (pccf) of Himachal Pradesh. Then there is the comparison with administrative and police services. "This drift away from field knowledge and practice is a consequence of making ifs a central service, pitting it into a needless status war with ias and ips. This process began in 1967, and the field-oriented, knowledgeable foresters have got replaced by the products of this white collar, centralized culture," said Karanth. This has led to new pressures on cadre management. "There is a lot of infighting within the service," said Sharma. "People want lucrative posts like pccf. So strings are pulled to get these posts and instead of one pccf per state there are three or four." Among the ranks, job satisfaction is low. There are no amenities, no break from physically demanding work, and salaries are low, as are opportunities for promotion. For forest guards, it is little more than a government job to make ends meet. "Before I joined the service I was teaching at a school. But that was a temporary position, so when I got this job I took it up because it is a permanent position," said R L Maravi, forest guard in Kanha National Park. The work load has increased because of low recruitment. "In the Sunderbans, there is a 50 per cent vacancy at the forest guard level and a 25 per cent vacancy at the forest ranger level due to a fund crunch. The sanctioned staff strength has not been increased in 30 years," said Pradip Shukla, director of the Sunderbans biosphere reserve in West Bengal. 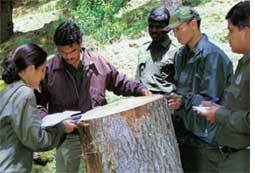 The 50 per cent vacancy at the forest guard level exists across the country, and has resulted from government policy. The average age of forest guards is high--in some states it is 50. The ageing guards have to work harder, because the beat area to patrol on foot remains high. 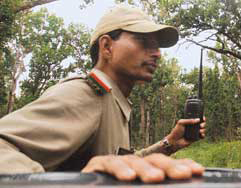 Jharkhand's Dalma Wildlife Sanctuary has one guard, instead of the six required, per circle of about 2,400 hectares. The mismanagement of India's forests begins with mismanagement of recruiting and training in the forest departments. A daily wage worker, earning between Rs 100-150 a day, is posted to help each guard with patrolling, maintenance and cooking. Food supplies come from the nearest village market a few kilometres away. The guard and the worker share the food cost. There are small mercies, though. "At least we have walkie talkies now. When I joined the service in 1972, our only option was to walk to the range office," said forest guard Ramakant Mishra at the Indri camp. "This is our only means of communications; sometimes days go by without meeting another person," said Maravi, the walkie talkie hooked to the belt of his khaki trousers. At the Koppedabri camp, Maravi climbed to the roof of the two-room house to talk to the deputy ranger at Khisli camp. "The signal is good only on the roof. Otherwise I can hear them, but they cannot hear me," said Maravi, 29. A walkie-talkie can be the difference between life and death for a guard. Mishra recalled how in 2005 a bear attacked a forest worker of Indri camp cycling through the forest. After it left him alone, he managed to get up and limp to Simti camp, where he found nobody. He cleaned the wounds with an antiseptic and half-walked half-crawled to Indri. "He would have died if he hadn't the determination to reach the camp no matter what," Mishra said. Then there is the tale of a forest guard killed by a camp elephant in 1994. In forest guard stories, wild animals seem different from the wildlife documentaries--on foot, one does not get to see too much wildlife, only signs of their presence. On his beat, Maravi pointed at a patch of flattened grass and said it indicated a bison had rested there, probably the previous night. Mishra had a stint with wildlife research he kept watch over a tigress and her two cubs for 10 days. All he could recall was that the cubs obediently followed their mother. The guards said the villagers surrounding the forest dislike them because the department routinely says no to all their demands. But, unlike the officers, the guards interact with the villagers. Earlier, two guards lived in a nearby village, but it was very uncomfortable living in close proximity with people who are always at odds with the department. The guards moved out. A team of armed ex-military men, hired under the Tiger Protection Programme, have what the guards do not firearms. "They complain often about the hardships of living in the forest camps," said a range officer. "It surprised me. Surely army life is tougher? But the men say that in the army, all arrangements are made for them. On a scale of 1 to 10, they rate army life as 9 or 10. And life here 1 or 2," he said. Patrolling the borders attracts more romance and privilege than patrolling the source of water, air and biodiversity. Frontline staff--forest guards and foresters--is recruited by the state governments only and trained for six months at state training colleges. Recruitment has been irregular, depending on money. "In 2006, some 600 new forest guards were recruited after a gap of about three years in our state. After no recruitment for years, now suddenly there is a huge influx," said Gulab S Verma, divisional forest officer who heads the forest training college at Chail in Himachal Pradesh. Jharkhand is in a worse spot. "The last recruitment of guards was in 1985 when the state was a part of Bihar. 2,500 posts are vacant in the state. This is out of a total required cadre strength of 4,200," said A K Malhotra, pccf in charge of human resource development in Jharkhand. This impacts training. Jharkhand has four training colleges for frontline staff, but two are closed.The remaining two are conducting induction courses for guards who joined several years ago. In Madhya Pradesh, untrained recruits have been given posts and are learning on the job. Since recruitment is abrupt and in large batches, promotion by seniority becomes a difficult task. "I joined as a forest guard in 1972. I got promoted to a forester in 2002. With less than a year before retirement, my chances of further promotion are nil," said Ramakant Misra of Kanha National Park. Both the Centre and the states recruit forest officers. Those recruited by the Centre get appointed as assistant conservators and those recruited by states are appointed range officers. Technically, the state service officers are eligible for promotion into the ifs as assistant conservators. But this rarely happens. ifs officers too talk of stagnation. Though an assistant conservator of forests is eligible for promotion to deputy conservator after three years of service, this rarely happens. The next promotion to a conservator ought to come after 14 years of service, and the one after that, from conservator to chief conservator, after 18 years. After 28 years of service, an officer is eligible for pccf. But this rarely happens. Actually, it takes 18 years for an officer to become a conservator and 25 years to become a chief conservator. "By this time the officer has reached the end of his career. So instead of retiring as a pccf, he retires as a ccf," said Prasad of the ifs association. The association blamed the ias officers of the Union Ministry of Personnel, Public Grievances and Pensions, which controls the service rules for the three all-India services and can overrule the environment and forests ministry, which is headed by the secretary of forests--an ias officer. It said ias officers get promoted faster than ifs officers of the same rank. In 2001, the ministry of personnel issued a circular calling for austerity measures in recruitment. "They said each year, recruitment should drop 10 per cent for five years. But in 2006, this reduction was extended indefinitely," said Savita, head of Uttarakhand's forest service college in Dehradun. Mukherjee said this is the ias's way of controlling ifs. After recruitment, ifs probationers train for two years at the I G National Forest Academy in Dehradun and the L B S National Academy of Adminstration in Mussoorie. This includes four months of field work and travel to various parts of the country. By the end of training, the Ministry of Environment and Forests assigns officers to various state cadres, where they serve their entire career except for when they take up deputation assignments. The cadre allotment was based on performance during training; the top two probationers chose their cadre. In recent years, the ministry has assigned officers to cadres early during training. While the probationer is asked if s/he would opt for the home state, the decision is up to the ministry. "Like others, I had asked for my home state, Uttar Pradesh, but was given Tamil Nadu.Before 1986, probationers were given a choice [apart from the home state] but not now," said Yogesh Dwivedi, conservator of forests of the 1988 batch. Officers of the state forest services train at the three State Forest Service Colleges in Dehradun, Coimbatore and Burnighat. The training is similar to that of ifs. The national forest academy claimed its syllabus reflects the change in the service's mandate. "In recent years, the training has moved from a revenue-oriented outlook to one of biodiversity conservation and people participation," said R K Goel, the academy's additional director. "We also keep up with recent trends at the global level. The syllabus was revised in 2005 keeping all this in mind." But a casual look at the syllabus is enough to reveal that while topics like conservation, joint forest management and ecology are covered, the emphasis is on silviculture and timber, which get the most amount of training time. In comparison, wildlife barely gets a mention. Even in the training of forest guards, silviculture and engineering training takes almost half the total training time in Himachal Pradesh while biodiversity conservation gets less than a fourth of the total time. "Our main emphasis is on silviculture as this is the backbone of forestry," said Devinder Chauhan, range officer at the forest training college in Chail. The structure of Indian forestry still has not factored in biodivrsity and wildlife conservation. "Research and training are separate departments in Himachal. There is no specific training on research methodology," said Gulab S Verma. The syllabi give the impression that the forests are still looked at as a timber source to be managed and harvested and 'regenerated through plantations'. "Revenue generation is still considered a major goal though the forest policy has moved away from this to conservation and people's participation. The social and communication skills needed for this are not taught. The service is unaware of its impact on the people. This does not bode well," said N C Saxena, former secretary of the planning commission of India. "There has been a revision of the syllabus for the frontline staff. But here at Chail, we are yet to implement it because of a lack of infrastructure. The new syllabus calls for more field visits which is not feasible yet. It also makes major changes such as completely dropping the soil conservation module," said Verma. The National Forest Commission said training is extremely classroom-oriented and wastes a lot of time on basic, school-level biology. The report also says that the Advanced Forest Management courses, which are refresher courses conducted for serving officers, are underutilized by the officers. And that there is not enough participation in these classes by the officers even though they are requisite for promotion. The National Forest Policy is a study in policymaking and non-implementation. Twenty years after it was released, there has been no progress on most of what it called for--increasing forest cover to 33 per cent of total land, increasing productivity of forests, social forestry programmes to meet fuelwood demand, ensuring diversion of forestland is accompanied by payment for compensatory afforestation. The preferred way to increase forest cover for the state forest departments is plantations. While plantations are good for getting timber, they do not a forest make, biodiversity being the obvious absence. Neverthelesss, the departments count plantations as forests. "Don't call them a forest. They are not. Call them welfare schemes to meet fuelwood needs," said Sen. The demand for fuelwood was to be met by social forestry schemes like jfm (Joint Forest Management) which were to also restore degraded forests. The programme has not fared well, the common complaint being the forest department's recalcitrance in recognizing people's rights in management and benefit sharing. Communities do not get their share of the profits from timber harvests. The National Forest Commission recommends foresters need sociology training to understand people's rights and needs. Millions of forest dwellers have not had their rights recognized, and yet mining industry gets land with ease. In 2003 and 2004, industry got 100,000 hectares of forestland diverted. While forests have got depleted, money collected in the name of compensatory afforestation has accumulated. Under the Forest Conservation Act, a project that diverts forestland has to pay for afforestation to make up for the loss. In 2000, a petition filed in the omnibus forest case brought to the court's attention the compensatory afforestation funds lying unused. There were cases of states charging industry for compensatory afforestation and not even collecting the money from the industry. The court directed the Union ministry of environment and forests to gather all the funds and place them in a central fund which would be monitored and disbursed by a Central body, the Compensatory Afforestation and Management Planning Authority. This was to be created by November 2002. It is yet to be formed. The policy objectives cannot be achieved if the service does not move beyond its timber obsession. The service badly needs to create a working relationship with communities living in and around forests. Conservationists as well as community rights activists feel the service needs to decentralize some control over forest resources and management--and acquire more knowledge. Many ifs officials recognize the need for these changes, although grudgingly--but this gets lost in the din and clamour for more money, better promotions, more autonomy. "The service has the resources and it can develop the necessary capability to achieve its mandate," said Kanchi Kohli of the conservationist non-profit Kalpavriksh. "It has to because the alternative would be too grim to contemplate. It will take a change in thought, a change in mindset. The bureaucracy needs to change and at present that is not happening." Rapid loss of forest cover has made it imperative to protect what is left and to regenerate some of what has been lost. This is needed not just for mitigating climate change but also ensuring clean water and livelihood for a substantial part of India's population. In the 80 pages of the National Forest Commission's recommendations is the call for specialization in wildlife and forestry within the service; the need to involve the private sector in plantations for timber; better training of the forest service; a greater focus on marine biodiversity conservation; the need for ecological research within the forest service; and equal rights of forest department and community in jfm. The commission, though, was appointed by the ministry--not created under a law, and not even approved by the cabinet. This means its recommendations are not binding on any agency. This reflects the importance given to the overhaul of the forestry sector. With a booming economy and population, pressure on India's forestland will only increase. How the Indian Forest Service reacts will determine its future--and, more critically, that of India's forests.